During this workshop we demonstrated that foreign languages are not codes that are entirely closed off until you’re ‘fluent’. In fact, students are pretty good at understanding and translating from Portuguese, though they may not think so. 'It's all Portuguese to us!' is all about giving students confidence to dive into the linguistic unknown and dare to find a way, even without previous knowledge of the language, simply by making the most the clues provided by the context and by the languages they do know. 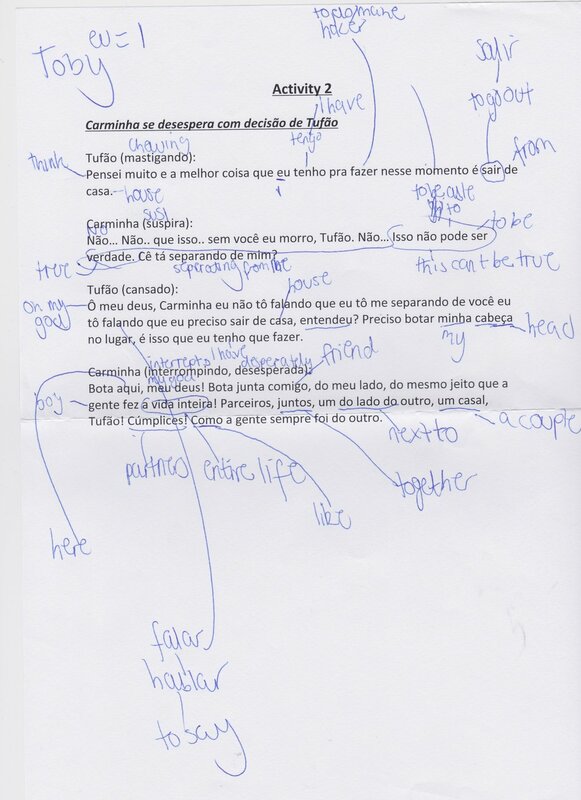 The principal activity from this workshop drew on a scene titled ‘Tufão pede Monalisa em casamento’ (Tufão asks for Monalisa’s hand in marriage), from the Brazilian telenovela Avenida Brasil. Having discussed the various ways they could make sense of the Portuguese text, from picking out similar words and finding structures familiar from other languages to making sense of punctuation, proper nouns and exclamations, students were given the text of the script only, to try to brave their way to as complete a translation as they could manage. Only at the end of the workshop did they watch a clip of the show and see how well they had understood and translated the text. For this Subtitling Masterclass we were very pleased to welcome the professional subtitler Clémence Sebag to lead the workshop. Clémence gave a introduction to the skills and software needed to subtitle a wide range of media. Students were then asked to watch and listen carefully to a section of Kanye West's song 'Through the Wire'. After rehearsing the skills they would need to use - compression and distillation of each line to within the character limit for subtitles - they wrote their own subtitles for the track. Not only did they interpret in order to compress and distill, they also brought to bear their skill with register, bringing Kanye's idiosyncratic style into a more formal English. Students watched the video of grime artist Kano's 2016 song 'Garage Skank'. They were shown a transcription of the chorus and invited to translate it from Kano's East-London slang into a formal register of English. No easy job for a first piece of fully-fledged translation, the students had not only to work out what was happening in the song and find a new language for it, they had to keep in mind elements of rhyme, rhythm and form, so that their translations also worked as lyrics. Students looked at the first six tweets from Olivier and Livingston's translation of Les Liaisons Dangereuses into a novel composed solely of tweets and discussed how each letter had been distilled and compressed into a single tweet. They followed up ideas of personal interpretation and appropriate, idiomatic language to compose their own tweets, translations of the key 'bet' scene in the films Dangerous Liaisons or Cruel Intentions, aka letter V from the original novel. The results were diverse, smart and often hilarious. Three stills from the 2012 Chinese film of Dangerous Liaisons were discussed in detail by the group. Elements including dress, setting, expression and posture were analysed as clues to the characters and relationship between the two protagonists, the Merteuil and Valmont figures. Students then composed potential thoughts for the images, conveying the seducing and scheming ideas they had divined in these characters' heads, simply based on the three images. Interpretations ranged from the literal (orange juice and cigarettes) to the paranoid fantastical. 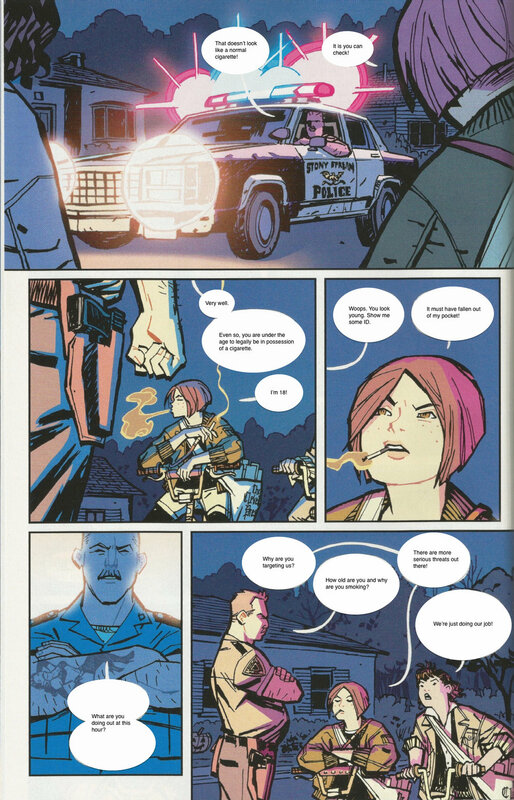 Students were given a blank strip from the comic Paper Girls and were asked to fill in the speech bubbles in groups. Their objective was to look carefully for clues in the images that could translate into speech, such as where the strip is set and what action is taking place, the relationship between the characters, their expressions, the size and spacing of the speech bubbles, etc.